Telecare is as much about the dignity and the independence of a person as it is about the equipment installed in their homes. Telecare devices support the individual at home and care packages are tailored to meet their needs. The solution can be as simple as a Lifeline unit in the home and a pendant worn by the individual. For individuals with more complex needs the package can include detectors and monitors to automatically trigger in the case of a fall, activity or inactvity, or when gas or smoke are detected. Telecare can be active or passive. 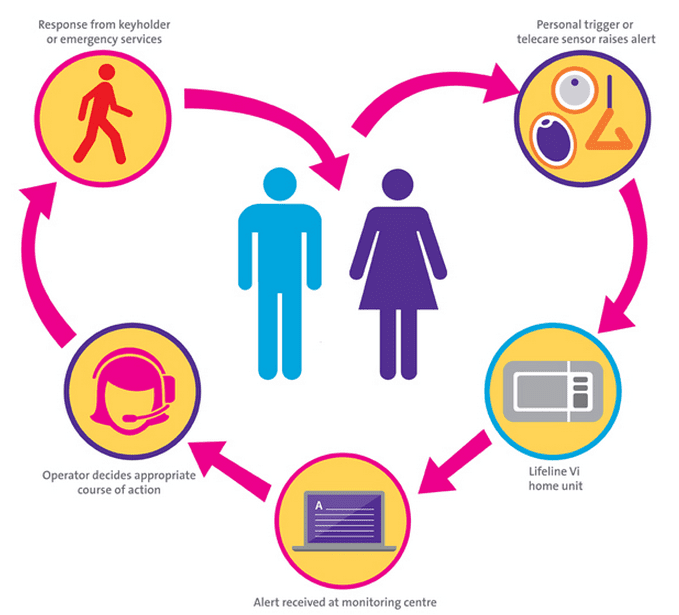 Active telecare requires the client to activate an alarm call for assistance via their Lifeline unit by pressing the call button on the unit, or by triggering their pendant. Passive telecare is when an automated alert is raised by any installed sensor such as a fall detector. In either case the user then speaks to the monitoring centre operator through the powerful hands free speaker on the lifeline unit. The operator can then assess the situation and contact the user’s designated family member, neighbour or carer. The operator will wait on-line to reassure the user until help arrives. Tunstall’s innovative range of non-intrusive telecare sensors, work with Lifeline home units to offer a comprehensive way of managing the risks to a person’s independence, health and home environment, 24 hours a day,7 days a week. Tunstall’s range of advanced solutions for grouped housing schemes provide peace of mind for both residents and care staff, by enabling easy communication. Grouped housing communities can utilise Tunstall’s range of telecare sensors to ensure that on and offsite care staff are immediately alerted to potentially dangerous situations.